What are the main advantages over the bundled version (distributed by some hardware vendors)? No time limit,enhanced recording abilities (MPG, M2V, MP2, TS), FREE updates. As a registered user you will get access to a private section of the website. DVBViewer allows you to experience Digital TV on your PC. With a proper DVB card you can enter the world of digital entertainment and experience high quality, incredibly sharp TV pictures and near CD quality radio! nVidia GeForce, ATI Radeon, Matrox G400 or better. The DVBViewer is a shareware application, this means that we offer a trial version which allows you to test the program before you consider to buy it. Please keep in mind that we need customers who buy the software in order to keep us and the project alive. This is why we removed all functions which are not required in order to make sure that the software is working. 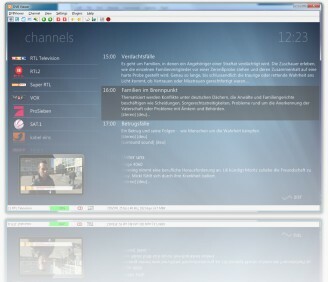 The following list contains all limitations, in comparison with the DVBViewer Pro. If you download the software below,you confirm that you have read and agree with the license information. If you like the software and want to use it without any restrictions then you need buy it. To do so, please click the following link.